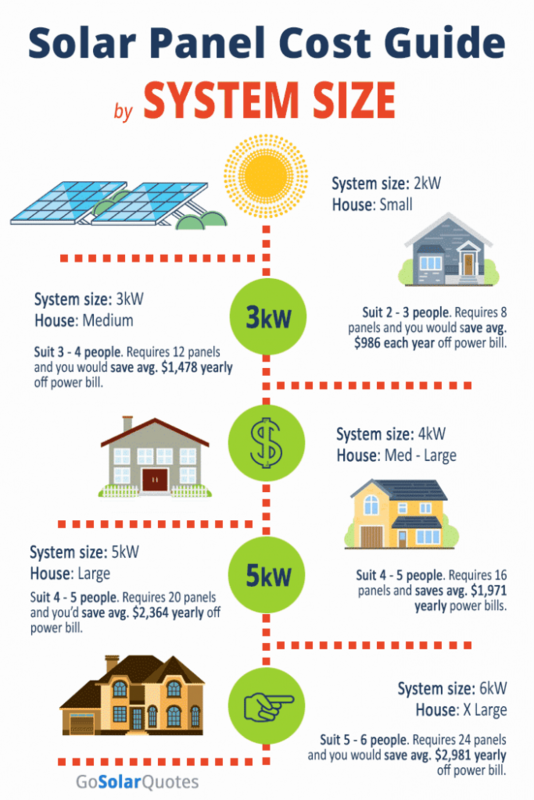 This guide will give you a quick run-down of solar panel costs and everything involved with installing solar on your home. We also include some handy ways to save money on installation. What does solar cost to install on my home? Is solar getting cheaper or should I wait? How much do I save each year? Are batteries worth it as I use consume most of my household power at night? What are the upfront costs of getting solar installed and is finance worth it? How much do solar panels cost by state in 2019? Can you make money back getting paid for excess energy produced? What factors can affect the cost of solar panels for your home? It depends on the size of your home and your energy consumption, but a solar panel system fully installed will cost you between $2900 and $9000. The reason for the large range in price mostly has to do with the size of the unit or number of panels being installed. Also the quality of the system you decide to purchase does play a factor. Is solar getting cheaper and should I wait? Solar is getting cheaper as every year passes due to the large spike in Chinese production, and market hyper consumption. This along with the Australian governments Small-scale Renewable Energy Scheme (SRES) has meant that installers have struggled to keep up with demand for the last few years, and for good reason. Should you wait? Not really. With the cost of power steadily on the rise in Australia and the interest free finance available specifically for solar installs, there is no reason why you should not get a system installed taking advantage now of this far cheaper form of energy production. We have created this table to quickly and easily show you the cost of solar panels for an average home. We have included the size of the system required, number of panels, the number of people per home this system can support, and lastly the saving per year you will enjoy off your power bill. Solar panel manufactures are broken up into tier 1, tier 2 and tier 3. These tiers basically separate the larger companies from the smaller ones. Another way to say it is Tier 1 are bigger more well-known producers like Panasonic, Trina, LG, Canadian Solar etc. and their solar panels cost more than tiers 2 and 3. This is not to say other manufactures produce solar panels of lower quality, it’s just the tier ones have been at it for a while not as with a warranty that lasts 25 years, you want to be sure the company is still going to be here if you want to make a claim in 10 years-time. So you will pay less for tier 2 and 3 panels, but what is the real cost if you can’t claim on warranty? The reason solar panels cost different amounts in different states of Australia is because the rebate each state pays per KW produced is different. Also the number of panels required to generate the same amount of electricity also varies from state to state. Refer to the below table for specific information on how much solar panels cost in Australia by state. At risk of stating the obvious, this all depends on the size of your home and the amount of power you consume. It will also depend on the amount of physical space you have on your roof to lay the panels. A typical roof top solar has about 24 panels, but some larger systems have up to 40 panels. Considering the average solar system pays for itself in 3.5 years, and they come with a 25year warranty, it’s pretty safe to say that solar is going to save you a lot of money in the long term, thought that being said it is a significant outlay to begin with. If you view it as an investment, you will have less trouble dealing with the initial cost. Besides, let’s not forget there is interest free finance available. It would be like paying your “regular” bill off over a 4 year period, but at the end you own the unit! On average it will take you about 4 years for the system to have generated enough value in electricity production to have covered its own cost outright. This can be a little be quick for small units and for households that consume less at night. How much will I save each year? Below is a table that outlines the yearly saving per system size, as well as the life time saving for the same system. Bear in mind these are averages, but it will give you a good idea. Are batteries worth it if I use consume most of my power at night? In that case yes, over the long term installing a battery with your rooftop solar system will be worth the extra cost. The biggest misconception about solar is that your electricity bill drops to zero. You need to remember solar only works when the sun is out. At night you pay for all the electricity you consume, unless you can store the power with a battery. These days there are loads of companies that offer no deposit and zero interest for the first couple of years on solar installation. That means you can walk right into a solar system with nothing down. The payments will be very similar or less than your current electricity bill, so there really is no reason not to get a system installed. Basically if you use more power, you are going to need a bigger system to keep up with demand. It kind of cons with the territory with larger families. More lights, televisions, fridges etc. The more power you need, the more your solar power system will cost. Depending on where you live in Australia will affect the cost of solar panel installation in a few ways. Different states have different rebates so this affects the overall cost of system installation. Also, the amount of sunlight you get in Tasmania will be different to that in Darwin, so the number of panels can vary to produce the same amount of power. If you don’t do your research, you can end up paying twice as much for the same quality solar system all depending on the brands of panel and inverter your installer talks you into. Some homes are a bit of a nightmare to install panels on and it simply takes longer. For example a 2 story house with a flat roof is going to take longer than a single story home with a pitch that requires less work. Labour costs are a factor, but not as much as the hardware itself.